Parents of Picky Eaters Unite: Is the One Bite Rule the Answer? When kids are dead set against trying new foods, it can drive parents crazy. One talked-about solution to combat this is the one bite rule. Also referred to the no-thank-you bite. Sounds great right? Well, it depends. Let’s take family A. Their two girls are a little older, school aged, and they have a one bite rule at meals. Their kids respond well to this, sometimes they like the food, other times they don’t. Meals are pleasant and the kids don’t feel pressure. Now let’s check out family B: These parents have one child, Charlie, who is a preschooler. He is picky and also has issues with textures. When they first started this one-bite rule Charlie stayed at the table for two hours refusing to try green beans. His parents stood their ground and Charlie finally took an itsy bitsy bite of the green beans. After this, Charlie hated coming to the table and often gagged on the food his parents made him try. Clearly, in family B, the one bite rule is backfiring, making Charlie less interested in trying new foods — and eating has become a chore. 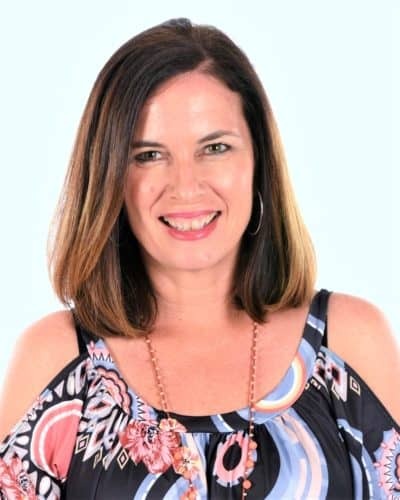 Katja Rowell at Family Feeding Dynamics has brought this topic on her blog and she makes a great point. The temperament of your child makes a big difference. Is the child stubborn, easy going or something in between? 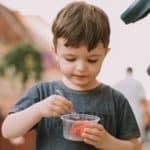 In other words, some children will view a one-bite rule as the push they need to try new things while others will be totally put off by it. And as I pointed out in a previous post, every child has a different food personality. Some are more adventurous while others take a longer time to learn to like a variety of foods. Another key factor involved is age and the related development. 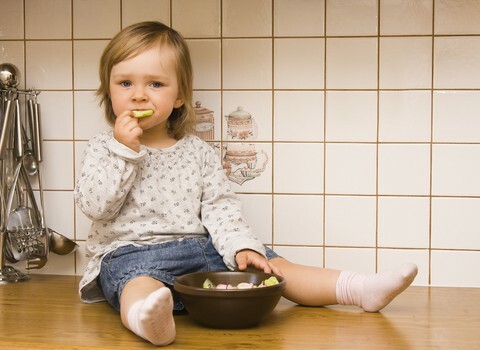 Kids under the age of 6 display almost obsessive-compulsive behavior about things including food and eating. For example, Big A will only eat French toast if the egg is not visible. One time I told her to close her eyes while eating — that didn’t work! According to the textbook, The Developing Person (my nightly reading — sad, I know), this OCD type of behavior starts to dissipate around age 6, right around the time kids start kindergarten or move on to first grade. This is also the time many experts say kids open up to food. it goes over a lot better. Does the one-bite rule go against the Division of Responsibility? My biggest problem with the one-bite rule is the fact that the child has to take the bite. What if they refuse? Will they have to sit at the table until they eat? 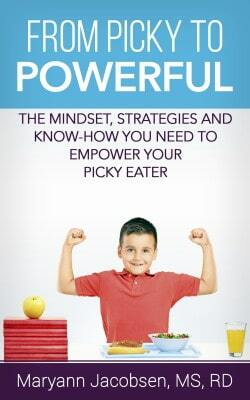 And I agree with Satter, I think it is powerful for children to try foods on their own — and I don’t want to take that sense of mastery away from them. But I also understand, firsthand, how frustrating the process can be for parents with late-blooming kids. I’m also not a big fan of rules at the kitchen table. 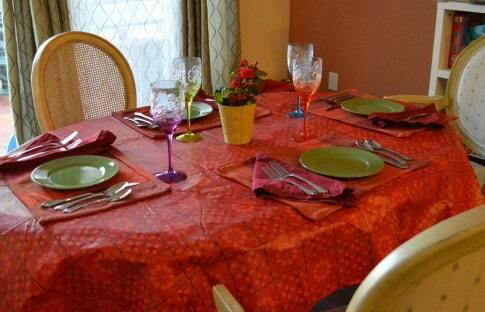 Once the meal is made and available to everyone, I want to relax and enjoy. The last thing I want to do is enforce rules of them taking a bite of everything. When I experimented with rewarding Big A for using a big girl cup for milk, I realized this kind of thing is not for me– or her. In the end, it comes to knowing your child and yourself. You may not view your feeding style as pressuring but if your kid sees it that way, that’s all that matters. Just like we tailor our parenting to different kids, we need to do the same with feeding. So what have your experiences been with the one bite rule either in your home or as a child? There was a “one bite” rule when I was growing up. You didn’ t have to clean your plate – but you at least needed to try something before declaring “I don’t like it”. That worked fine for our family. No harm done. I hated broccoli as a kid – LOVE it as an adult. Now my son, only child, 6 years old is a nighmare at dinner. I couldn’t institute the “one bite rule” if I tried (or if I did, there would be twice the clean up after he gags on it). Thanks for sharing Melanie. It just goes to show how different kids can be! I find my kids respond to the ‘one bite rule’ for grandparents but not for us. That must be something related to how the kids perceive the grandparents ‘authority’? I don’t do it and ask that others involved in their feeding don’t either. Our only ‘rules’ at the dinner table are about their behavior- no standing in the chairs, no messing around- if you aren’t going to sit nicely with everyone you have to get down. Only problem with that is that once they’ve been told they have to leave the table because they cannot behave, they continue to be a distraction from a distance! It is so true that kids are different. My daughter has always been willing to at least try things while my so is NOT. He is now 10 and is slowly starting to announce that he will try something. He only started eating hamburgers last year, when he announced on a trip that he would be willing to try one at a restaurant, and luckily for us decided he loved it. So now I will give food to my daughter to try, but I just let him decide on his own. I had to sit at the table until I finished things (like LIVER) and I remember just sitting there, by myself. I would never do that to my kids. Thanks for the insight Allison. The funny thing with Big A (who is almost 5) is she says she loves food, like hamburgers, salad and salmon, but still doesn’t eat them. I know in time she will. Luckily my mom never made us eat anything, so I was pretty open to most foods as I got older. My oldest (11yo) is stubborn and will not do something just because I said to do it, so these type of rules don’t work for her. Unfortunately, my youngest (9yo) does whatever the oldest does (which is very annoying because on her own my youngest would be willing to try something at least once). Thankfully my oldest is finally starting to try new things – as long as I don’t push. The other day I cut up a kiwi and placed it on the table and went about cooking dinner. I pretty much ignored the kids when they came up and stared at it, but I did neutrally answer questions about it. They both tried it (tiny bites, but hey) and didn’t like it, but I thanked them for at least trying it. I know I will do this again (with kiwi even – because I love it). Karen — it can be hard when the oldest is more picky. So far my 2 year old doesn’t care about what his sister eats. Hopefully that will last — but I doubt it! I agree with you, Maryann, that you have to know your own kids. I can suggest to my 7-year-old that he try a bite (or even three) of a new food and he’ll gladly comply. My three-year-old? Forget about it. 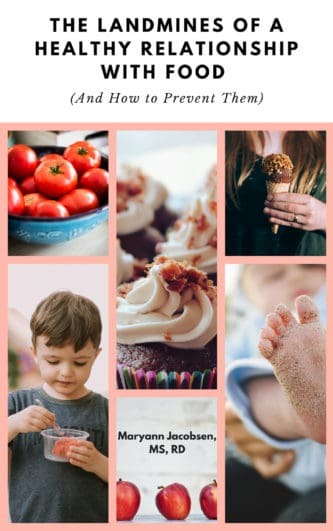 I used to have this one bite “rule” and we called it the “no thank you bite” but Dr. Dina Rose shared some great thoughts on this with me that totally changed my mind (in a nutshell, when you call it a “no thank you bite” you are pretty much telling your child she won’t like it and will want to say ‘no thank you’. Why that didn’t occur to me, I don’t know!). Sally — You are right about the no-thank you bite — sets them up to not like it. It’s interesting to have two kids so opposite. Usually me and Little D are left at the table because I eat slow and he loves to eat. Although he does have meals he either refuses or eats very little, like a normal toddler. About 7 months ago, I tried to make my then-20 month old daughter try a bite (I don’t even remember what it was). After an hour I gave up, feeling like a failure. A co-worker told me it works better once they’re older. Now I’ll ask her to take a bite and if she says yes then great but if she says no then I don’t push it. 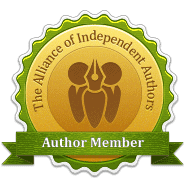 I love your blog, I’ve learned a lot since I’ve started reading. Your posts are relevant and practical. I’ve been reading for about a year and I’m still learning new things! I also love that your focus hasn’t changed. Some blogs over time seem to veer into a different direction, but you’ve maintained a sensible mainstream consistent approach. You are right – temperament is exactly the deciding factor on whether you can implement a one bite rule (having 3-year-old twins always makes this kind of comparison easily apparent!). We don’t have it as a “rule,” but we can more easily encourage my daughter to try a food by asking her to have a bite, whereas my son goes into full meltdown and stops eating if we encourage. The only rule at our table is that we all sit as a family and you don’t even need to eat a bite if you don’t want. Some nights they don’t, others we can’t stop them from having thirds! I have twin 2 year olds, a boy and a girl. My son will pretty much eat anything we give him, but my daughter is much more hesitant to eat certain foods. We don’t have a one bite rule, but I do ask the kids to at least take a couple bites of the foods that aren’t their favorites before allowing them to have seconds of the others. 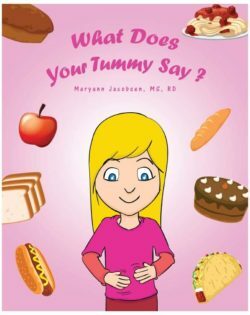 This has really worked well for my daughter, because if we have, for example, grilled chicken, brown rice, a fruit and a veggie for dinner, she would eat the rice and fruit, and ask for seconds of those without even touching the other foods. We do not force her to eat the chicken and veggies, but just say that she has plenty of food left on her plate, and to eat a couple bites of those before she gets seconds of her favs. If she refuses, I simply say, “That’s ok, you don’t have to eat them, you must not be very hungry anymore. You can be all done if you want to.” Then she’ll usually take some bites (if she’s still hungry), or will say she’s all done. It seems to have really done the trick so far, and has gotten her to try some new things, and like them! I think she really likes the idea that she can make the choice herself! In theory I like the one bite rule, but in practice, it isn’t working for us. I have seen it work for a number of people, but my daughter (age 4) is completely headstrong, and it just leads to arguments. We try to encourage new foods, but at the moment, she actually has her mind set to “I don’t like trying new foods.” In general though, she eats really well, so I’m trying to let go and just allow her to eat what she will of what we put out on table and hope that one day she will come around. A lot of the time we have to just let her have her fit, possibly go off and read for a moment, and when she is actually hungry and ready to eat, she’ll come back to the table and eat something. My aunt tries to remind me that one of my cousins went through a phase years ago where he would only eat pasta and now he is a complete foodie who is very happy creating great meals from only whole foods. We have gotten a little nuts about what our children eat, or at least, that’s what I’m trying to remind myself. I have 2 very very different eaters. With my oldest (and pickiest eater) I instituted a 3 bite rule. He was also pretty stubborn, but what worked was making desert contingent on weather or not he tasted the new food. It ws fine if he “chose” not to try the new food, but then their was no desert. It worked very well. It’s funny to see this post just as our family has been dealing with this issue. My 3.5 yo son who is a very structured, change averse child by personality who had a severe dairy allergy as an infant that was undiagnosed leading to feeding refusal issues recently started trying new foods thanks to the one-bite rule. We used to follow the Ellyn Sater guide to feeding and had the “this is dinner” philosophy and he could have dry cheerios to eat if he didn’t want to eat anything on the table. We thought he would eventually branch out and stuck with this for ages. As it turns out, he was fine for months eating cheerios and never trying anything new. Recently, we just figured, why not try something else? He seemed somewhat open to new ideas at the time. We started withholding his favorite foods until he tried one bite of something new. We never had a standoff more than a few minutes and now he is so proud of himself for trying new things. He comes to the dinner table and asks what new thing he needs to try tonight. It has become a fun game for him. He has even found a few foods that he likes (cheese! – my dairy allergy child is eating cheese! a breakthrough!) and some he just tolerates. He has yet to find something he truly disklikes. We’re really proud of him and are glad that he’s branching out. I think this approach is very personality dependent. (When I was a kid, the one bite rule ended in our house when my brother vomited on the table two nights in a row after trying something he didn’t want to and gagging.) But it’s worth a shot as long as you’re willing to amend if it doesn’t work. Thanks for sharing your story Christine. I’m glad the one-bite rule is working for your son. I don’t think parents should be afraid to try new things as long as it has positive spin. Children will let you know if it’s working. Just curious about folllowing Ellyn Satter. She doesn’t recommend offering alternative foods for meals, like Cheerios. Did you ever try not offering that as an alternative? No, Ellyn doesn’t recommend Cheerios. But I believe she recommended having bread or something on the table that your child could fill up on if they didn’t try the meal. We never ate bread or dinner rolls and my son loved rice, but we couldn’t offer him that daily. Instead, on the off days when there was nothing involved in dinner that he would touch, we would just put a cup of cheerios on the table with dinner. He didn’t have to ask for it. It was dry and not cereal with milk. It was our compromise. Maybe we undermined the point of the dinners. That makes more sense…it sounded like you gave him cheerios after he decided not to eat the meal. I have never tried the one-bite rule because, honestly, I never thought of it. I do always offer the kids bites of what we’re eating and my 4 yr old is very open to trying new things. My 7 yr old is not open (although the other day she ate a bite of spicy eggplant dish and loved it – weird kid!). The one-bite rule would probably work for the younger, but definitely not with the older. thanks so much for this post! we’ve just been discussing whether or not to institute a rule like this with our 3-year-old and after reading your post i really feel that it’s not necessary for us. We don’t call it a rule but if you want seconds of something you have to atleast try everything on your plate, no complaining until you’ve tried it and if we are having tacos or Vietnamese noodle salad I place all toppings on the table and tell the kids to pick at least two veggies. So far this has worked for us without too much stress on anyone. The rule also works for us because he has a history of severe feeding disorder and we are frequently dealing with motor control, texture issues, and food phobias. When we become lax about his food choices, he backslides. Great article thank you! 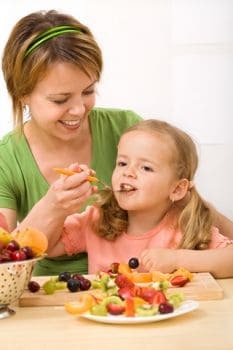 In my experience as a feeding specialist, I the one bite rule works great if the child’s sensory and oral motor system is capable of one bite. It’s a hierarchy of skills, so for little Charlie in the piece above, he wasn’t capable of taking one bite. Maybe for Charlie, one lick might have been an option…it all depends on the child’s level of comfort. One step at time, he will eventually get there, but we venture on this journey gently and make it fun. Thanks so much on your post. 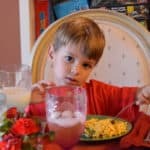 I was writing an article on “picky eaters” and came across this article. I’m hyper linking this post to my “One-bite rule” section. I have never been an enforcer of this rule in our house, because I don’t like any negative talk or examining my child’s food plate at the dinner table. If they don’t eat their veggies there is nothing after dinner. That is it. If they don’t like lasagna then they just don’t like it and I’m not going to make them take a bite of it. Although, they are missing out. They’ll see one day. I like to keep the peace at the table and make sure they get their nutritional intake throughout the day. Karen — a couple things could be going on. The pressure for her to take a bite of everything to get dessert doesn’t seem to be working for her, and may be creating a negative dynamic, espeically if she is naturally cautious with new foods. Maybe asking her to touch the food or smell it first, basically getting comfortablw with it. Also, do you provide foods she likes at meals at the week (like pasta)? Can you involve her in meal planning asking her for input? Maybe tell her that twice a week you will serve her favorite meals but you’d like her to take interest in the other food. Using dessert as a reward only creates more desire for sweet foods so I don’t recommend that. If she gags often she might have some texture issues and you might want to consider seeing a feeding specialist to rule out those problems. Let me know if you have any other questions. Wow, I never knew there were so many other families affected by selective eaters! My husband is in his 40’s and has a very limited palette. He eats any beef, chicken, pork AS LONG as there isn’t a sauce on it. Some sauces are okay, but there are only a few – sweet/sour sauce, general tso’s sauce, some steak rubs. But most herbs, spices render his food un-eatable. If there is so much as a speck of ‘green stuff’ or (for that matter, anything ‘foreign’) in his food, he will not eat it. He will eat shelled peas and corn, as well as romaine lettuce; for fruit he will have red or green apple, banana, red seedless grapes and the juice ONLY from an orange (he throws the rest away). He eats tons of white bread, sweets and soda – and due to his bad diet he is a diabetic. He is about 60 lbs overweight. One of our children, a 10 yr old girl, has eating problems as well. It began when she was near her 3rd birthday, coincidentally (!!??) the same time as she was finishing her potty-learning. She will eat chicken nuggets/fingers, some beef steak, hamburger, sugar cereal and some fruit juice. No whole fruits, no vegetables. At all. She will drink milk and eat pudding – these are her only two dairy. Oftentimes, she will eat only a cup of food throughout the entire day, which I know is too little for her age – hence my opinion that her eating habits are stunting her growth. I find myself so, so frustrated with the two of them – with her father moreso than with my daughter. I worry about her health, and I feel absolutely certain that she is short because she eats too little food, and primarily unhealthy food. I was interested to read that this eating disorder causes relationship problems because we DEFINATELY have issues with his food! After 12 years, I finally (about 2 months ago) told him that I will no longer make food for him. In his case, it is not only what he will eat, but HOW it is cooked. For instance, food re-heated in a microwave is unacceptable, it MUST be done in a ‘real’ oven. I am only allowed to use corn oil when baking or cooking. It is all very frustrating, depressing, boring and I feel controlled. So….he can make his own meals. Mind you, the dinner hour is now completely ruined. Oh well. I am sure you can all see my anger and hostility….and I admit that I am. I guess my understanding has just dried up for all this pickiness. . . I do think understanding is the first step towards finding effective ways to deal with a problem. Maybe ask her husband for more insight into his food preferences? Explain that you want to raise your kids to eat a variety of food and be healthy and maybe there is some type of compromise you can come to — meeting halfway? I hope things get better! I’m not sure what the right answer is, but I’m not convinced that this isn’t it. 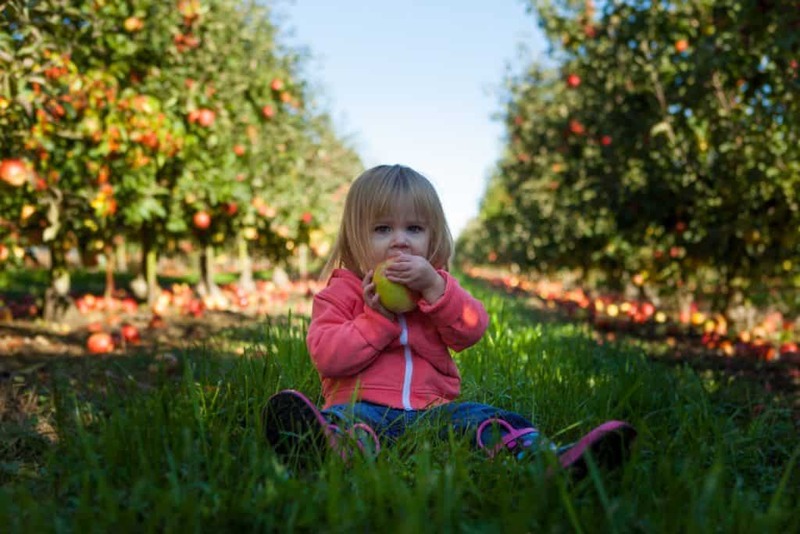 Adults get over picky eating the same way kids do – repeated exposure and having an open mind. And adults don’t have as many taste buds so that’s one advantage you have. That’s where I think a lot of people miss the boat. I think for some it’s about a texture aversion and I don’t think anyone grows out of that. I think it’s more compared to getting over a phobia. If that’s the case then I think something similar to the one-bite-rule might actually be helpful. For normally developing kids the research shows exposure, family meals and role modeling are the best predictors of healthy eating. More controlling and permissive feeding practices are associated with poorer eating in children. These just show links, not cause and effect. I do my best to provide parents with the latest research so they can make the best decisions for their family. My son is 9 and I am struggling for him to eat healthy. He loves all the wrong foods and I have been trying for years for him to eat healthy but it is like he has a mind block. He instantly starts gagging, crying and having anxiety. He is overweight and I worry about diabetes. I have tried freezing grapes, making smoothies and if he sees a spec of anything game over. School lunches are a nightmare. Is the sitting at the table until he tries something the right thing to do? Please help any advice is helpful. I really wish I’d read this post yesterday. We tried the “one bite” rule with our son tonight, and it was a disaster. He’s 4 1/2 years old and an only child, and we’ve found that sometimes the only way to change his behavior (poor sleep habits as a baby and taking a long time to potty train) is to jump in head first and just do it (we did the cry it out method for sleep training and the “no diapers” rules for potty training, with great success). Tonight was awful. Our son is extremely stubborn, especially about eating. He likes some decent foods, like homemade breads, raisins, granola bars, cereal, and milk, but we’re baffled that he seems disgusted by new foods. Or even foods he used to like! Tonight we had soup and cornbread, and he usually loves to eat cornbread, but because we told him he had to take at least one bit of something on his plate, he refused to take even one bite of the bread. He had a massive fit and eventually we gave him a bath and put him to bed, kicking and screaming. We listened to him cry himself to sleep (which he hasn’t done since he was a baby!) and it was awful. We didn’t want to back down because we feel we back down too much and let him have too much control. I read so many books and advice about how parents are too weak and their kids walk all over them, so it feels wrong to “let him have his way.” But like you point out in this post, one piece of advice just doesn’t fit all. I don’t know what to do tomorrow night. Do we tell him Mommy and Daddy were wrong and he gets to be the boss again? We could tell him he won’t get his bedtime snack (a granola bar and raisins, his healthiest meal of the day – which he also didn’t get tonight), but that will just postpone the fit until right at bedtime, and still make him feel pressured and make it a negative situation. I just felt like if he realized we weren’t backing down, he would give in. Why wasn’t that the case? What now? Thank you for your post – it’s a relief not to have someone say “just do this and your child will do this.” That doesn’t always happen with our son and it’s so frustrating. It might help to step back and learn about why your son is doing what he does. You might want to check out my book Fearless Feeding and both of my picky eating series. I am completely at a loss on how to deal with my 3 and a bit year old son. His entire diet consists of cheerios (no milk), vegemite toast (a yeast spread that us Aussies love – very high in vitamin B), peanut butter sandwiches, crackers, water and the very occasional banana. That’s it. No dairy, tons of carbs, no fruit or veg, and the only protein he gets is from peanut butter. He was a fantastic eater as a baby (breastfed for 13 months, ate everything he was offered and then slowly, slowly ate less and less until we’re down to what we’re currently at). This is in stark contrast with his 5 year old sister who eats just about everything (she was caught gnawing her way into a block of parmesan cheese and a bunch of shallots in the shopping trolley at the supermarket as an 18month old!) and favourite snack is steamed carrot and zucchini sticks. 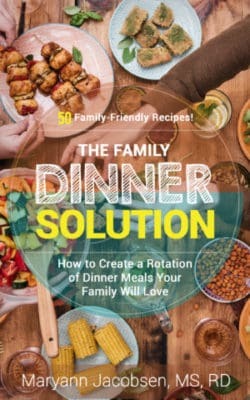 My husband & I eat a great variety of foods and we do our best to have family dinner on the weekends (hubby gets home too late on weeknights for dinnertime with the kids). We very very rarely eat any sort of junk food and don’t offer candy or chocolate to the kids (they can have whatever they like from party bags, but generally Miss 5 says “there’s too many lollies in here for little girls to eat” and only has 1 or 2 things and throws the rest out. Master 3 will eat a lollypop and ignore everything else. But I am at a total loss as to how to manage my son’s diet or lack thereof. I know the ideal is for mum, dad and the kids to sit down together and eat the same meal, but that only ever happens on weekends, when everyone eats the same thing except for Master 3 who has a peanut butter sandwich. No dessert as he doesn’t like anything. He won’t even try things that most kids adore: nuggets, sausages, chips, ice-cream, chocolate. While I’m happy about that, I’m torn between letting him get there eventually and insisting he try something new. Most of the time I will put little pieces of what we’re eating (a piece of chicken, a small piece of potato, carrot, 2 peas) on the side of his plate for him to try at his leisure but he either ignores it or chucks it on the floor (which earns him a timeout – you can ignore it, but you can’t throw it). But what I’m completely unsure about is do I keep giving him his sandwich and wait for him to come around to the good stuff or do I take the upper hand and just give him our dinner and let him go hungry if he chooses to go without. He’s very stubborn and I know that he would go without dinner indefinitely. Bribery is futile (not that we haven’t tried it periodically. Hubby is definitely keener for the hardline approach that we all endured as kids, but then he doesn’t have to do it everyday). I know I’m not alone, but boy, it sure feels like it at 5.30pm every.single.day. Any advice would be gratefully received. Thank you! I would start with having him evaluated since he eats so little foods. This way, you can be sure that there’s not something else going on. There are resources at the end of this post. If there is nothing wrong, I have have two picky eating series and e-book entitled: From Picky to Powerful that can help develop a strategy. I would not suggest letting him go hungry, that is the worst advice for a selective eater. I would ask him to choose a side he wants with family meals and keep offering it to him. In general, 3 is one of the toughest ages to feed kids because their growth slow down and they aren’t very hungry like they were before. I am glad to hear Maryann’s advice not to let your son just go hungry. 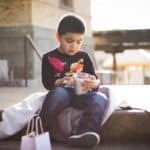 I wrote one of the posts above back in early 2014… almost two years later, our son’s eating habits are better, but there haven’t been any miracles. We enforce the rule that he must sit with us at dinner, and I include something I’m at least 50% sure he’ll eat. Sometimes he gets upset and refuses to eat anything, so we shrug our shoulders and tell him he has to wait until his bedtime snack. This sometimes encourages him to just pick up the fork and eat, but often he’ll just push his plate away and sit there. He’s learned that pitching a fit doesn’t earn him a special meal, so that helps. I think it’s important to minimize mealtime battles, especially with stubborn kids like ours, because in my experience they’ll see it as a power struggle and react accordingly. I think you’re doing the right thing, making sure he has some of the family dinner on his plate, whether he leaves it every night or not. I was a picky eater as a kid, and I remember that even thinking about eating veggies made my mouth go dry. My tastes changed in my mid-20s and now I love veggies. I doubt our kids will be this picky their whole lives.